Ever wish you had someone to clean your house for you? Well, now you do. With the iRobot Roomba Vacuum, you can have a clean house all the time without having to lift a finger. 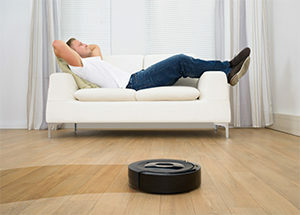 Powered by smart sensors the Roomba vacuum moves throughout your home cleaning the floors immaculately as it travels. Amazingly the smart vacuum makes 60 decisions per second to navigate around furniture and other items in the house. Roomba picks up crumbs, dirt and pet hair effortlessly freeing up your time for more important things. This modern vacuum uses Dirt Detect technology to sense high-traffic areas and concentrated messes. It also cleans walls and corners seamlessly. Roomba technology uses a three-stage system of sweeping, grabbing and suction for efficiency and you can control it using your mobile device.